One Aviation's "Project Canada" will now formally be known as the Eclipse 700, One Aviation chairman Alan Klapmeier announced yesterday at EAA AirVenture 2017. A cabin mockup and virtual reality presentation of the Eclipse 700 are on display this week at the show. Development work on the small twinjet is continuing, but One revealed this week that it has selected the Garmin G3000 avionics suite, Acme Aerospace lithium-ion battery system and PPG Alteos electronically dimmable interactive cabin windows using Nuance V2 shading by Vision Systems. 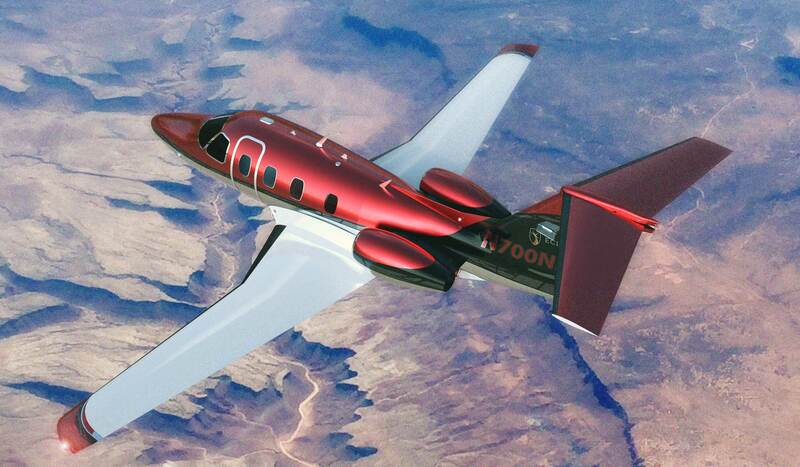 The Eclipse 700 features a four-foot longer wingspan, a 14-inch fuselage stretch and a longer horizontal stabilizer than the EA500/550 series. It will be powered by Williams FJ33 engines. Klapmeier said the changes not only give the 700 more speed and range, but make it "a real six-seater airplane. The changes that the 700 brings to this marketplace really do create a different market." He cited the aircraft's rate of climb, range, simplicity of operation and ability to get into smaller airports as appealing to customers. Klapmeier said going with Garmin avionics will bring the aircraft more in line with contemporary standards and help "lower barriers to entry" for people to move into the airplane. He said the Williams engines provide ample thrust even on hot days at altitude, generating a 75-knot difference between the 550 and the 700 on such days and enabling an NBAA IFR range of 1,470 nm. Klapmeier said the price for the new airplane remains at $3.6 million and that the company holds approximately 30 orders, mostly from current Eclipse owners. He added that this does not include orders from China, where he thinks the aircraft will have considerable appeal. There will be a trade-in program for current Eclipse owners. According to Klapmeier, the market for the Eclipse 700 is significantly larger than that for the EA500/550. He estimated that work on the Eclipse 700 could be finished within 18 to 24 months, contingent on raising capital. One Aviation is looking for an investment of $100 million to restructure the company overall and "less than $50 million" to finish the 700 in particular. "We feel very good about the interest in the airplane. It will be a new type certificate under the new simplified Part 23 requirements. We feel good about the certification schedule, because the FAA is being cooperative," he said. "And we feel good about the engineering schedule because the scale is so limited. So it is 18 to 24 months, and it is low enough risk so that the airplane will be in production before certification, so we can deliver them as soon as we get the paperwork." For now, the company's Kestrel single-engine turboprop project has been shelved. "Everyone's working on Canada," he said.